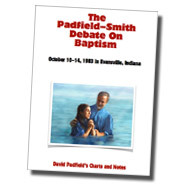 In 1983 Gerald Smith, a Missionary Baptist preacher from Lexington, Kentucky debated David Padfield of Evansville, Indiana on the subject of water baptism. Much of the debate centered around John 3:5, where Jesus said, "Except a man be born of water and of the Spirit, he cannot enter the kingdom of God." Gerald Smith tried in vain to remove the word "water" from this passage. The following links will take you to articles, debate charts and audio files related to this debate. Download Charts from the Padfield–Smith Debate. Over 100 overhead charts used by Padfield in this debate (PDF file size: 10.3MB). "For The Remission Of Sins." David Padfield wrote to several prominent Greek scholars and posed this question: "Is it grammatically possible that the phrase 'eis aphesin hamartion,' 'for the remission of sins,' as used in Acts 2:38, expresses the force of both verbs, 'repent ye and be baptized each one of you,' even though these verbs differ in both person and number?" These letters were quoted in the debate several times. This booklet contains photocopies of their responses and explains the phrase "for the remission of sins" in a very detailed manner (PDF file size: 640k). According the the rules for this debate, each speacker was given three 20-minute speeches per evening. These audio files are saved as MP3 files—you can click on the links to listen to them now, or right-click with your mouse and "Save to disk" to listen to them later. Each file is approximately 40MB in size. The first two nights of the debate were held on the campus of the University of Evansville on October 10 and 11, 1983. The proposition debated was, "The Scriptures teach that water baptism is for (in order to obtain) the remission of sins." David Padfield affirmed this proposition and Gerald Smith denied it. The final two nights of the debate were held in the meetinghouse o the Northwest Church of Christ in Evansville, Indiana on October 13 and 14, 1983. The proposition debated was, "The Scriptures teach that remission of sins for the alien sinner comes at the point of faith, before and without water baptism.” Gerald Smith affirmed this proposition and David Padfield denied it.